Battling to the final buzzer, Boulder City High School’s football team gave it their all Friday, Nov. 2, before its heartbreaking 32-30 loss to Pahrump Valley. (Robert Vendettoli/Boulder City Review) Senior running back Thorsten Balmer, seen Oct. 25, 2018, breaking free for a first down against Del Sol, ended his career with Boulder City High School with three touchdowns in their heartbreaking 32-30 loss against Pahrump on Friday, Nov. 2, 2018. Fighting for a 3A state semifinals bid, Boulder City ended the season with a 7-4 record, its best since 2012. Staying competitive with the Trojans throughout the night, the Eagles held a 22-12 lead midway through the second quarter before a six-minute sequence gave Pahrump Valley the lead at the half. Trojans running back Nico Velazquez scored on a 90-yard kickoff, followed by a rushing score in the final minute to give Pahrump Valley a 26-22 halftime lead. Driving the Eagles down field late in the game, junior quarterback Parker Reynolds had his best game of the season, completing 9-of-13 for 228 yards and a score. Reynolds drove the Eagles to the goal line before senior running back Thorsten Balmer plunged his way in for a 1-yard touchdown with six minutes remaining. 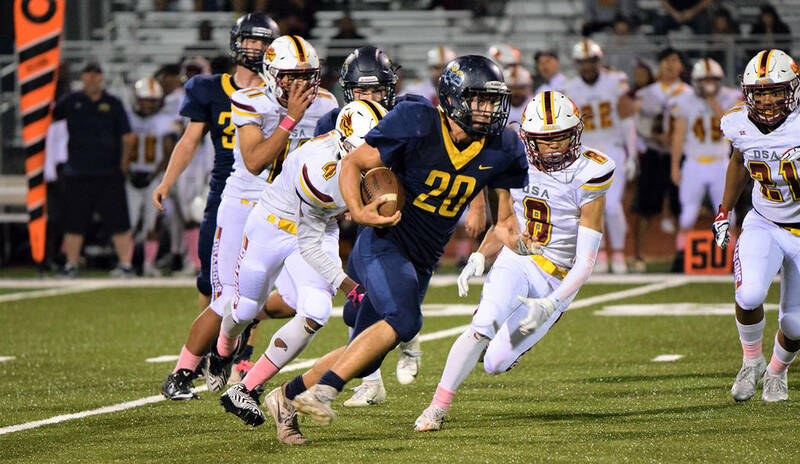 Unable to get the Eagles in the end-zone again in the fourth quarter to extend their season, Balmer ended his prep career with 98 rushing yards and three touchdowns on the night. Reynolds, who returns next season, linked up with senior Jimmy Dunagan for a 2-yard touchdown pass midway through the second quarter. Reynolds found sophomore Deavin Lopez for 99 yards on four catches, while sophomore Matt Morton caught two passes for 38 yards. Dunagan ended his senior year with two catches for 64 yards and a score, while making a team-leading 17 tackles on defense.